Each year, Cycling Utah recognizes the best riders, events, and clubs in Utah with our year end awards. Cycling in Utah is booming, with more people participating, more bike trails and pathways, and more excitement than ever before. We present our awards below. Keegan Swenson had a season that most riders couldn't even dream of having. The mountain biker from Park City was on a roll in 2017, winning three USA Cycling Pro XCT cross country races and three short track cross country races in the biggest mountain bike series in the country on his way to finishing second overall. He won the True Grit 50, along with the Park City Point to Point. He won several cyclocross races including some in the Utah Cyclocross Series. He added a second place in Short Track National Championships and a remarkable 5th place in the Pan Am Continental Mountain Bike Championships. Keegan Swenson is our 2017 Overall Rider of the Year. Tiffany Pezzulo had a solid season on the road. She won the overall in the USA Crits series, the premier national criterium series, along with three races in Utah on her way to finishing 4th overall in the UCA points series. Tiffany Pezzulo is our Female Road Racer of the Year. TJ Eisenhart is nicknamed Sunshine. His sunny personality and skills on the road bike led him to a stage win and the overall victory at the Redlands Classic Stage Race. He added a second place in stage 2 of the Colorado Classic and 4th overall, 3rd Overall at the Tour of the Gila, and 11th overall at the Tour of Utah. TJ Eisenhart is our Male Road Racer of the Year. Sofia Gomez Villafane had a stellar season on the mountain bike. The Park City rider had three 2nds, a 3rd, and a 4th place in the Pro XCT series cross country and short track races on her way to finishing 5th overall. She added a 3rd place in the True Grit 50 and 11th in the Pan Am Continental Championships. Sofia Gomez Villafane is our Female Mountain Bike Racer of the Year. Zach Calton was on a roll in 2017. The collegiate racer from the University of Utah won the overall USA Cycling Collegiate National Championship Omnium. 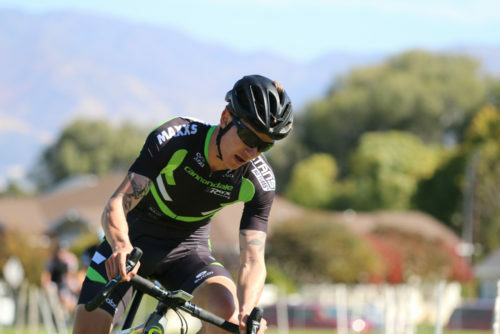 He added two wins in the Intermountain Collegiate Cycling Conference series in cross country and downhill on his way to winning the overall season title. He added an 8th place in the Park City Point to Point. Zach Calton is our Male Mountain Bike Racer of the Year. Lauren Bingham races all types of gravity – downhill, enduro, super-D. She won the USA Cycling Junior Enduro National Championship, finished 4th overall in the Pro Women category in the Scott Enduro Cup, and took two wins in the Utah Downhill Series Cat 1 women's category. Lauren Bingham is our Female Gravity Racer of the Year. Mitch Ropelato goes downhill faster than most riders in Utah. In 2017, he won the USA Cycling National Championship Dual Slalom, the Sea Otter Dual Slalom, the NW Cup ProGRT Downhill, and two races in the Utah Downhill Series. Mitch Ropelato is our Male Gravity Racer of the Year. Sarah Kauffman won the Utah Cyclocross Series for 2016. She finished 3rd in the USA Cycling Masters 35-39 National Championship, and won 4 races in the UTCX series. Sarah Kaufmann is our Female Cyclocross Racer of the Year (2016 Season). Kevin Day stepped up in cyclocross in a big way in 2016. The racer from Farmington, Utah won 6 races locally and nationally. He topped the podium twice in the Utah Cyclocross Series on his way to 5th overall and then added 4 wins in the masters fields at Cross Vegas, Charm City, DCCX, and CXLA. Kevin Day is our Male Cyclocross Racer of the Year (2016 Season). The Bicycle Collective was started 15 years ago with a mission to put more people on bikes. 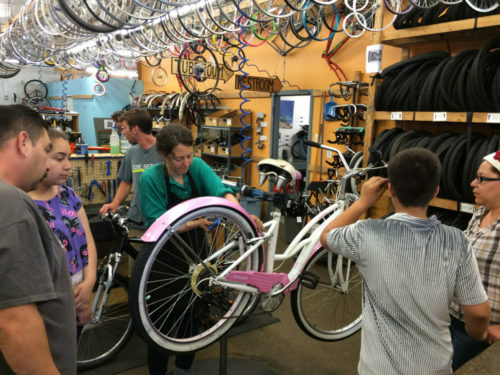 This year, they opened the St. George Bicycle Collective, bringing the total number of community bike shops in Utah to 4. In recent years, they have acquired a building in Ogden, and upped the ante in Provo, while maintaining a stellar shop in Salt Lake City. The Collective each year puts thousands of people on used bikes, some which the giveaway to needy people and organizations. Their Park Tool School Classes teach many how to work on bikes, and their apprenticeship program trains people to be mechanics. For others, they provide a safe space to learn about bikes. They are an invaluable asset to Utah. The Bicycle Collective is our Bike Advocate of the Year. The Intermountain Cup Mountain Bike Racing Series has been running for close to 30 years in one form or another. This year, organizer Joel Rackham and crew have reinvigorated the series and really improved the racing. With great courses, categories for all riders, and food for the riders after the race, the ICup is back on form. The Intermountain Cup Racing Series is our Event of the Year. Zone 5 Racing showed up in force to the Utah Cycling Association races, as well as to the Utah Criterium Series Races. With team and individual wins in several categories in the crit series and a great showing across the categories, Zone 5 is our Road Racing Team of the Year. Bingham Cyclery – Peak Fasteners Mountain Bike Club is a fun loving bunch of mountain bikers who like to race and ride. They show up at all of the mountain bike races, and enthusiastically support each other both at the races and after. One of the best features of their team is that they bring donuts to the races for team members and friends. In 2017, they won the Intermountain Cup Series Team Points competition. Bingham Cyclery – Peak Fasteners is our Mountain Bike Team of the Year. Bonneville Cycling Club has been around for over 30 years to provide ride opportunities for Utah cyclists. With their nationally renowned Little Red Riding Hood ride, and dozens of club rides including multiple rides on many days, BCC has it down when it comes to organizing a club. Last year, the Little Red ride raised over $120,000 for breast cancer research at the Huntsman Cancer Institute. In 2017, cyclists traveled 199,107 miles on club rides, climbed 4,997,408 vertical feet, and commuted 18869 miles in 3382 trips, saving 17359 lbs of carbon. Bonneville has earned more awards from Cycling Utah than any other group because they deserve it. Bonneville Cycling Club is our Touring Club of the Year. Lou Melini is a force of nature on the bike. He commutes everywhere, tours long distances, writes for Cycling West, and advocates for more people to ride. In 2017, in the Bonneville Cycling Club Commuter Standings, Lou finished first with 398 trips and 2718 commuting miles. Lou Melini is our Bike Commuter of the Year. Naish Ulmer crushed it in the downhill in 2017. He won both the Utah Downhill Series Overall in downhill and in Super-D, winning 3 races along the way. He competed in the Scott Enduro Cup, taking five overall in the Pro Men's. Amanda Batty for 2nd in the USA Cycling National Downhill Championships, as well as many other solid results in downhill. Cortlan Brown and Mary Emerson for winning the UCA road series. Haley Batten for winning the U-23 USA Cycling Cross Country National Championship. Lia Westerman for great results all year in both cross country and gravity mountain bike events. Nicole Tittensor for winning the Intermountain Cup Pro Women's and a top 10 in mountain bike nationals. Alex Grant for winning the Intermountain Cup Pro Men's series. Ethan Nell for finishing 3rd at the Red Bull Rampage. Logan Binggeli for finishing 3rd in the ProGRT standings and for finishing the Red Bull Rampage. Cody Kelley for winning all three Scott Enduro Cup events and the overall. 16 year old Bryn Bingham for winning the Nevada State Super D championships and for finishing 8th overall in the Scott Enduro Cup Pro Men's series. Mike Pratt for running a successful season of the Hangar 15 Pro Cycling Team. Landon Boogard and the Mountain Bike Enthusiasts of Utah, an awesome group of mountain bikers who give back to the community through trail days, bike drives, group rides, and more. Jared Eborn is the person behind Extra Mile Racing as well as a bike enthusiast. In 2017, Jared organized multiple road races and century rides, often stepping in to put on a race when no other existed on the calendar. He promoted close to 10 races, and a couple of Gran Fondos, including a women's only ride. He also served as the Utah Cycling Association Executive Director, helping to coordinate races and racers throughout 2017. Thanks for reading Cycling Utah for the past 25 years.